The lost weekend is a phrase used to describe an epic drunk weekend that begins Friday night and ends early Monday morning. As much as I love what I do for a living, there’s nothing like Friday when you’ve checked off your last to-do item on the list. An uncaged animal, you now have the next 50 or so hours to return to the comforts of your esteemed sanctuary, game cave or even make a random trip out of town. There are few things I relish more in this world than the feeling I get every single Friday evening when I make the drive home from a long, grueling work week. Rolling down the windows, undoing your tie, blasting the radio and taking in a good whiff of that sweet Friday night air. You know the weekend is here, and you know good times lie ahead. Whatever happened earlier that week is washed away as the weekend promises a respite. Punching out on a Friday is simply priceless! In the day nothing matters. It’s the night time that flatters. Some Friday nights I like to hit the town and check out what’s going on. 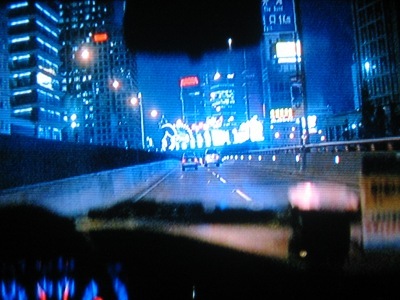 Other times I simply like cruising around with no destination in mind… letting the road take me wherever it shall. I’ve always been a night owl. My energy kicks in right when many prefer to sleep. 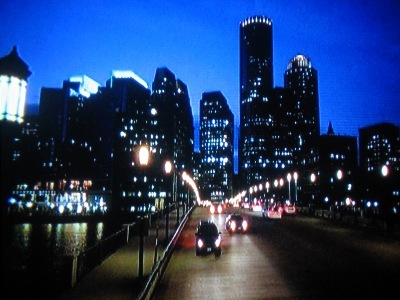 I’m not as outgoing in my old age as I once used to be, but I do still like to get out there every once in a while to sample a bit of the night life. Lately though, after an exhausting work week, I’ve found driving straight home to relax and unwind to be slightly more appealing. Being a night owl, there’s something magical about those 11 PM to 2 AM hours on a late Friday night/early Saturday morning. 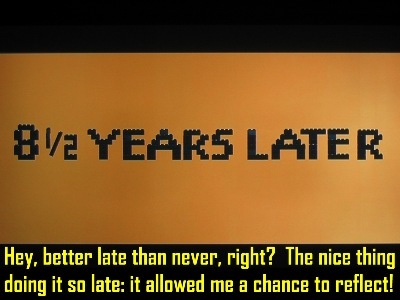 Sometimes I’ll throw in a movie. 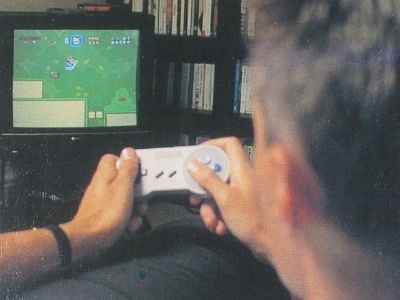 Or play the next SNES game on my queue. Other times I’m working on a review or just hanging out with some pals. Whatever I end up doing, there’s something precious about those late hours. A nice calm and quiet serenity to it all. Then Saturday morning comes. I just love to hang around town, or even stay in and take care of some projects around the house. More often than not, I’m usually chilling at home. No shame. I love those quiet early Saturday mornings… where it feels like the world is standing still for a brief moment or two. 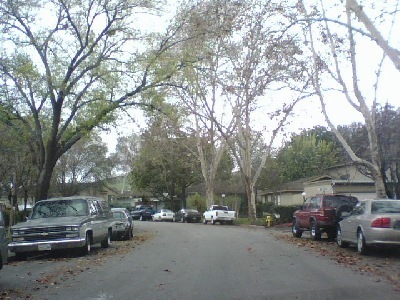 It’s even better during the fall season where you get weather like you see here. It’s so atmospheric — sometimes it’s great to hang out around the house chilling like a bum with no plans whatsoever. Saturday mornings and SNES? Sign me up! Sometimes I’ll stay in and play the next game on my queue. It’s a joy to explore my SNES library. I acquired most of these games in early 2006, yet still there remains hundreds I have yet to play. It’s the system that keeps on giving. Once in a special while, you have a weekend you will never forget. 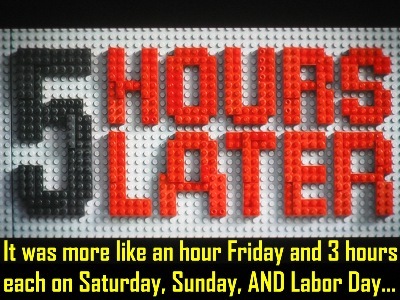 This past Labor Day weekend (2014) was one such time for me. I decided it was time to finally set up and display my complete in box SNES collection. A project LONG overdue! 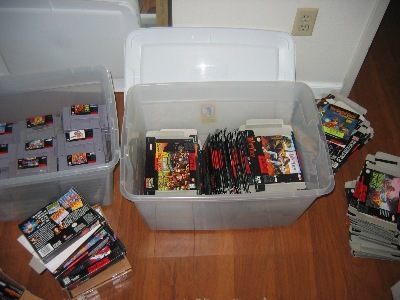 For over 8 years I’ve kept my Super Nintendo stuff tucked away in bins and boxes. Until recently I was inspired to finally set it up. 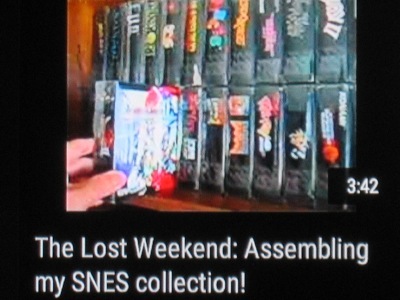 I was inspired by a video on YouTube that showed movie critic Chris Stuckmann’s N64 games in badass box protectors. They looked über shiny and glossy. 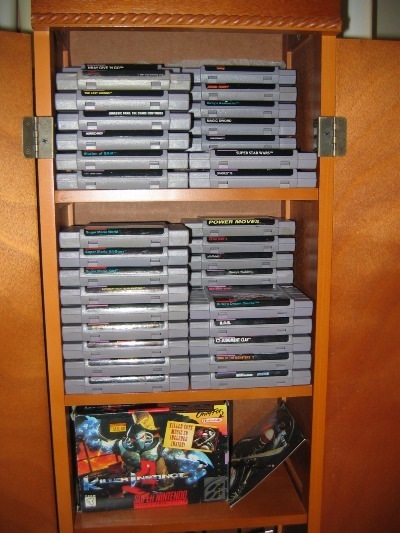 I knew right away that I had to do the same for my SNES collection. 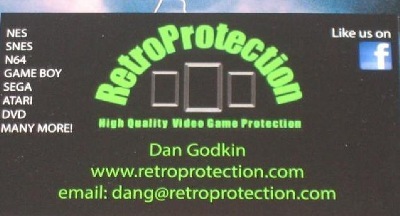 I contacted Dan of retroprotection.com and purchased 200 box protectors for $142. That may seem like a lot, but at 71 cents a pop, I believe it’s more than worth the investment, especially given how flimsy SNES boxes are. And like I said, it adds a nice classy sleek look. 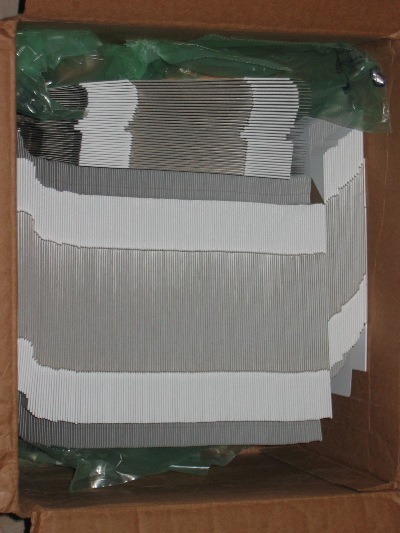 I bought 200 tray inserts off eBay. 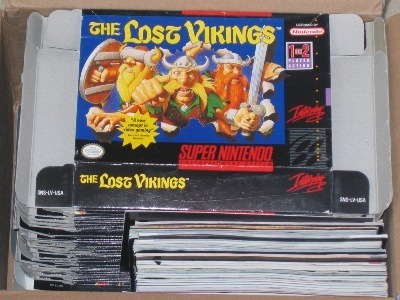 Most of my SNES boxes didn’t come with an insert. 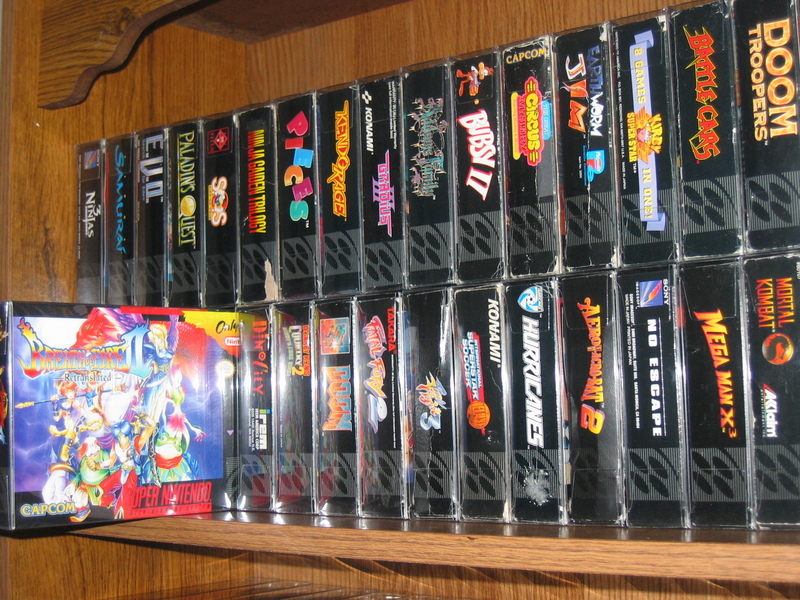 They help prevent the cartridges from rattling and are a must for your boxed games. The lost weekend began Friday night as I dug out my boxes and manuals in preparation for Saturday’s one man assembly line. Seeing the goods out in full force reminded me of how lucky I was that the nostalgia bug bit me back in January 2006, and not years later as the market would then explode. The prices these babies now command are insane. I was fortunate enough to beat the crowd. 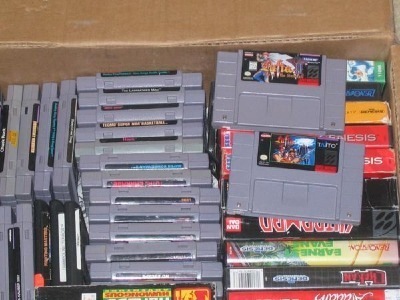 2006 was a golden time to be a diehard SNES buyer as many items were cheap still. Time for the one man assembly line! Wow. 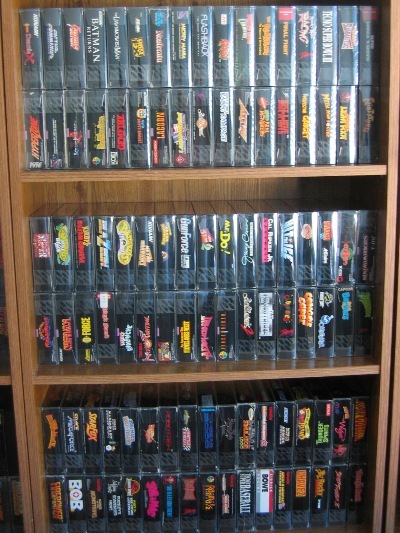 My jaw dropped as I stood back to admire my collection in half its glory. 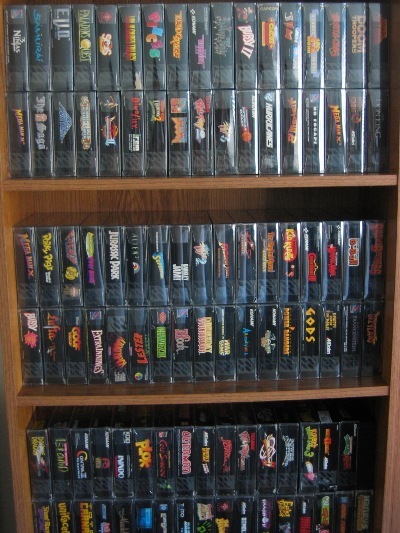 With another 200 or so games to piece together and display, this is ‘only’ 204 boxed SNES games. Wiping the sweat off my brow, I stood there for what felt like 30 minutes to admire the beauty of it all. I should have done this years ago! 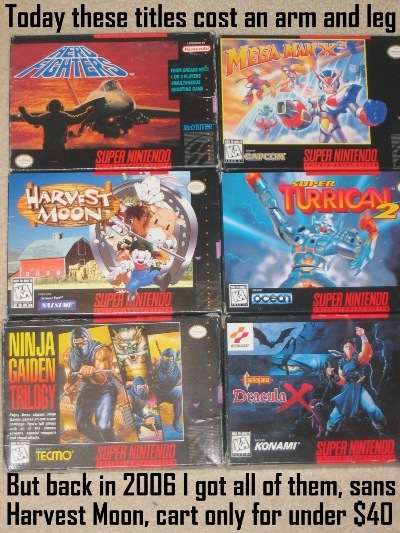 I love the SNES boxes. They’re flimsy but there’s something cool about them. They are, essentially, fragments of memories from my childhood! Love poking through my library! I love the small pleasures in life. And one of them is definitely coming home to your game room. Gazing at those gorgeous boxes and knowing you can pick to play any one of them at any time is an incredible feeling. On lazy weekends, I enjoy playing games I’ve yet to play and have been curious about for years on end. Now that my collection is displayed, I feel all the more fortunate to own all the games that I do. The offering of choices is endless and playing the rest of the games still left on my to-beat queue is a lifetime project. You know what I absolutely love? You know how sometimes you’ll get the strangest, most random urge to play a certain game? Like it just hits you between the eyes out of the blue. The feeling I get from going through my work day and then you head home with that game still on your mind. You can’t shake it. 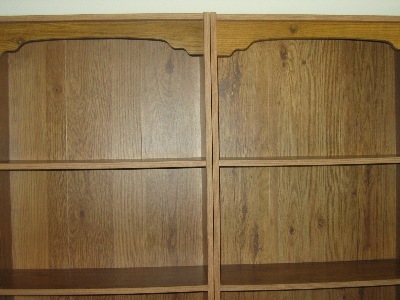 You enter your game room, find it on the shelf, take it down and pop it in. Good stuff. It’s part of what makes gaming so much fun. 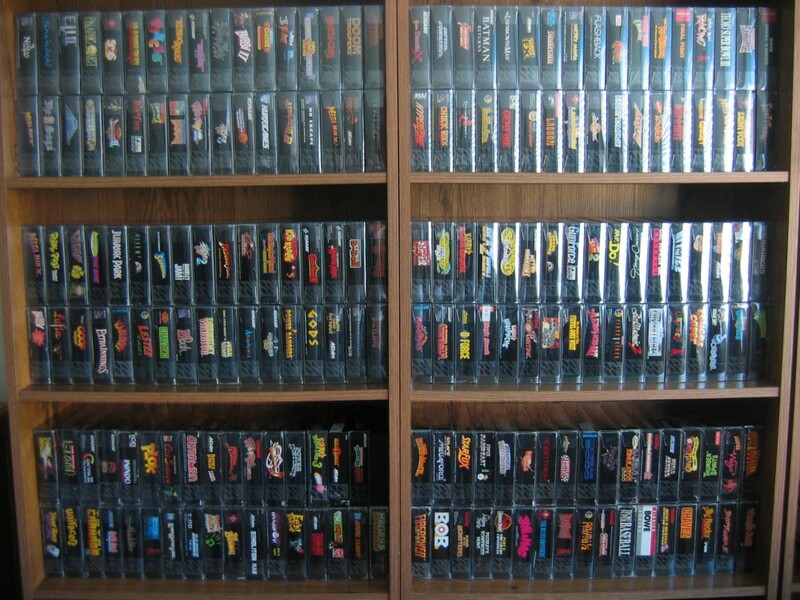 I love movies, but to me there’s nothing like retro gaming. They’re bundles of nostalgia and wonder. Hey, is it Friday night yet?